Starting a business is a dream for many and millions of Britons have made this happen. This number is continuing to increase year-on-year, as more entrepreneurial Brits take the plunge. Without a doubt, there are several perks to being your own boss, such as flexibility and being able to build your own company. It's also a lot of work, however, requiring determination and self belief. Running a small business can be tough. While following your passion can be very rewarding, there are also many everyday tasks that must be completed to keep your business functioning. To help, keep a to-do list in your Collins Debden notebook and look at these effective ways to get organised. Although more businesses are starting to use online storage, the majority of us still have at least some paperwork. This paperwork can cause a lot of disorganisation, especially if your office lacks a proper filing system. To solve this issue, sort your paperwork. Create piles for archiving, paperwork that is in-use, to be filed, and recycled or shredded. Or, to save additional space and organise more effectively, you could scan documents and only keep digital copies. Running your own business involves lots of time-consuming tasks, many of which need to be completed on a daily basis. This may include updating social media, scheduling meetings and bookkeeping. Although these are all essential, they don't need to take up all of your time. Instead of doing them manually, use technology and software to automate some of these processes more effectively and save you time. Clutter can be distracting and distracted is one thing you can't afford to be when you have a small business. 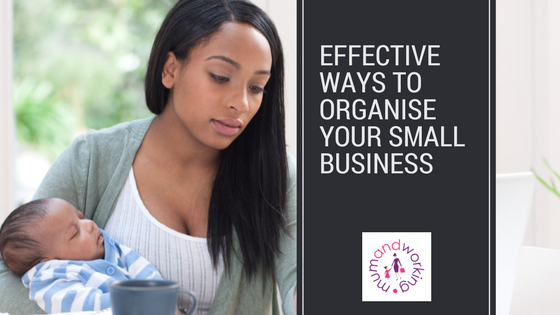 To keep your mind free and your business hours more effective, organise your desk or office space. Do this by recycling those stacks of magazines, donating old equipment, installing shelves or desk storage, and hiding away files and paperwork in a cabinet. A key part of being a boss is learning how to delegate. It may not come easy to all of us – especially when you've grown your business alone – but it's an important skill none-the-less and it could help your company to thrive. If there are tasks that you struggle with, such as accounting, you could outsource these to a third-party organisation. Or, if you would rather keep them within the office, consider hiring an intern or employee with a different skill set.